Are you looking for incredible things to do in Georgia (Europe – not the US state!)? Well, you’ve come to the right place because these 10 ideas for things to do in the country of Georgia will leave you wanting to come back to Georgia again and again. Well, I’ve traveled to over 65+ countries around the world. And, in my mind, none of them beats the incredible country of Georgia. So get pumped for your Caucasian adventure by checking out these incredible things to do in Georgia country. And, if you need more inspiration for the best places to visit on your trip, be sure to check out my list of the Best Places to Visit in the Country of Georgia and this Georgia Travel Itinerary and Guide. For most travelers, Georgia’s capital Tbilisi will be the first stop in the country. And with so many incredible things to do in Tbilisi itself, you’d be for giving in to the temptation to spend your entire Georgian vacation in this awesome city. The highlight of any visit to Tbilisi is a stroll through the Old Town. Ancient churches, monuments, and buildings are set against a dramatic hillside. You can climb to the top or zip up via a modern cable car. And if your bones ache from all that walking, you can literally soak in the city at the thermal springs located right in the middle of Tbilisi’s Old Town. Cross a bridge and on the other side of the Kura river you’ll find incredible modern architecture, which makes for an interesting juxtaposition against Old Town. 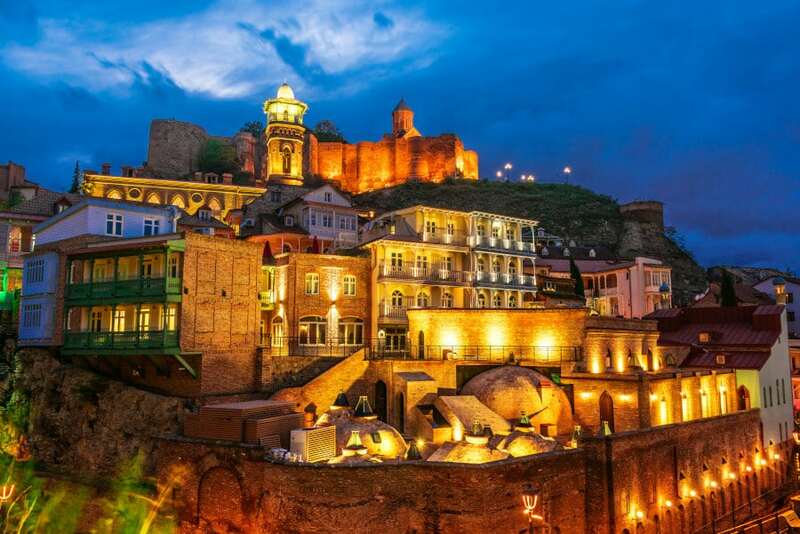 The best way to take in Tbilisi’s Old Town? Join a free walking tour! What’s a “Supra” you ask? Well, it’s basically a traditional Georgian feast. Picture plate after plate of delicious Georgian cuisine served up in a Georgian home, all while copious amounts of homemade wine is served up until late into the evening. So how do you go about attending a Supra? Well, frankly, you’re going to need an invite from some Georgian friends. So get friendly with the locals and maybe you’ll be just lucky enough to score an invite. Fortunately, Georgia has some of the most friendly people in Europe! The secret about Georgian wine is officially out. Georgian wine is quickly becoming renowned as some of the highest quality vino in all of Europe. And with good reason: the temperate environmental conditions in Georgia’s province of Khatkhati, combined with centuries of experience by the local vintners, make for seriously delicious stuff. 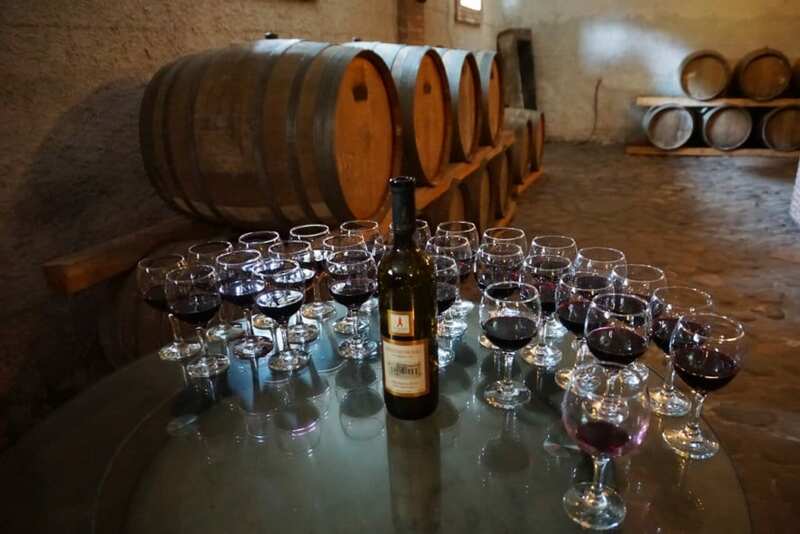 You can taste Georgian wine just about anywhere (many locals even make their own at home), but serious oenophiles won’t want to miss a tour of the many vineyards in Khatkhati. 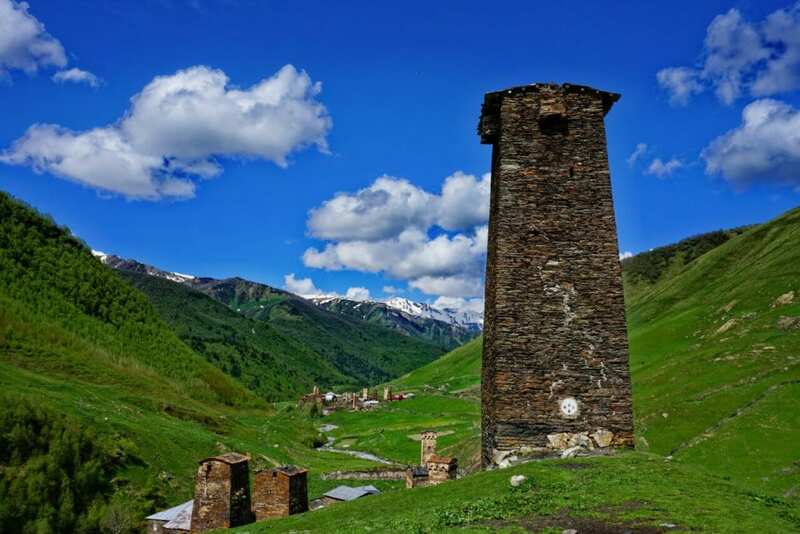 The province of Svaneti, Georgia is dotted with hundreds of ancient watchtowers that for years helped the local communities keep invaders at bay. Previously inaccessible except through a single long and winding road, Svaneti has recently begun to accept a flood of visitors, thanks in part to government-subsidized flights from Tbilisi. 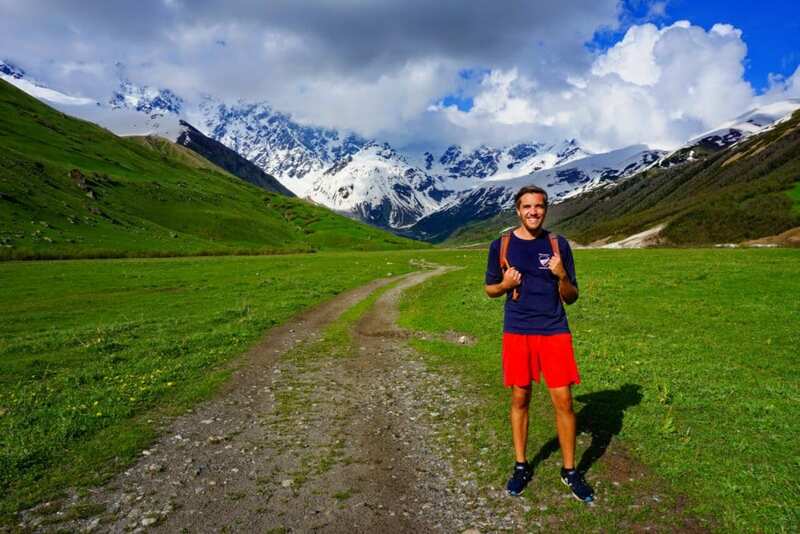 But, despite the increasing tourist numbers, visiting Svaneti remains one of the top things to do in Georgia the country. In my opinion, it should be your top place to visit in the country of Georgia (read the other best places to visit in Georgia Europe). You’ll feel a bit like Marco Polo crossing the famous Silk Road when you set out for your trek through the Georgian countryside. With soaring mountain peaks, expansive farmland, and lush forests broken up by tiny but welcoming villages, Georgia is probably one of the most underrated trekking destinations in the world. One of the more popular routes is the multi-day trek from Mestia to Ushguli, though there are dozens to choose from around the country of Georgia. I’m not much of a foodie, so if a food captures my heart you know it must be truly magical. And Khachapuri, the king of Georgian food, is the stuff of legends. This traditional Georgian cheese bread can be prepared a number of different ways, but by far my favorite is Acharuli. You’ll have to try it for yourself, but let’s just say that it involves an egg cracked over layers of doughy, cheesy goodness. 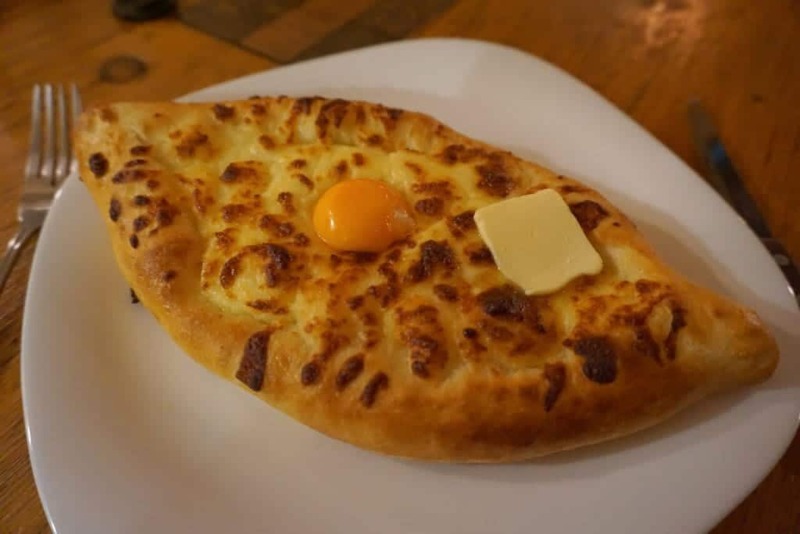 Just trust me, trying khachapuri is a can’t-miss thing to do in Georgia! 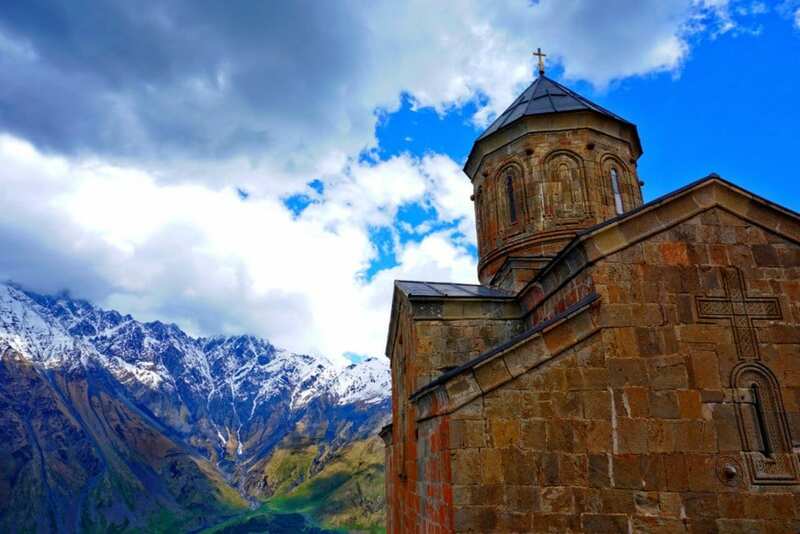 High in the mountains of the Kazbegi region of Georgia lies the Gergeti Trinity Church. If you’ve seen one photo of the country of Georgia, it’s probably of this iconic building set against the backdrop of majestic Mount Kazbegi. And, given the gorgeous scene, it’s no wonder why visiting the Trinity Church is one of the most popular things to do in Georgia. 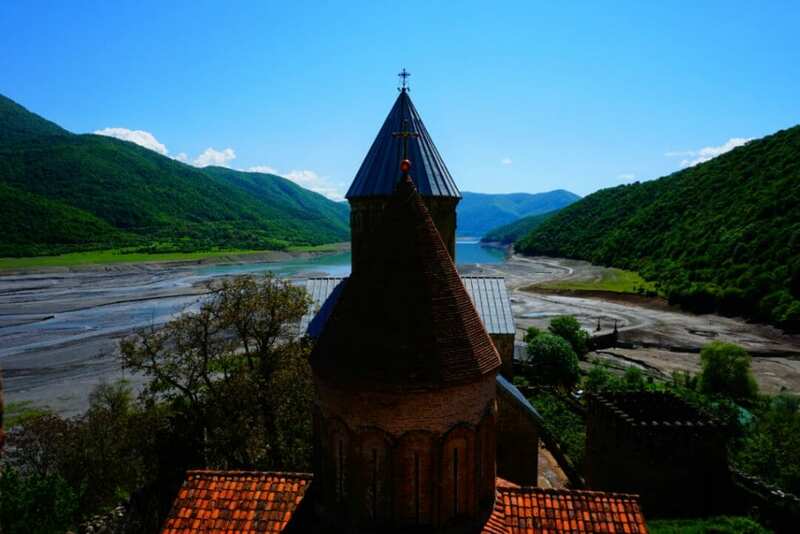 While it is possible to visit the church as part of day trip from Tbilisi, an even better thing to do in Georgia is to spend a night in the nearby town of Stepantsminda, then wake up early for a steep climb that will reward you with peaceful time at the iconic church before the tour buses roll in. Technically two castles joined by a wall, the Ananuri complex is an impressive work of ancient architecture made all the more fascinating by its stunning setting against the backdrop of the Aragvi river. Located a mere 90 minutes or so north of Tbilisi, a visit to Ananuri is an easy day trip. Or you can combine with a trip to Kazbegi to really take in the best of northern Georgia. In the southeast of the country of Georgia, near the boarder with Azerbaijan, lies the David Gareji monastery complex. This Georgian Orthodox complex is set against a rocky hillside, the complex includes hundreds of dwellings, churches, chapels and more. You also have the option to hike up the nearby hill for some incredible views. It’s possible to visit the David Gareji complex as part of a day trip from Tbilisi, taking in the gorgeous Georgian countryside along the way. There’s no sand to be found here, but don’t tell that to the hoards of Georgian and Russian sun-seekers who pack the pebble beaches of Batumi each year. The top thing to do in Georgia during the summer is clear: chill out (or get your party on) in Batumi. Georgia’s Black Sea resort town Batumi feels like it belongs in a different country altogether, as the modern architecture reminds one more of Singapore or Dubai. But, for all its modern facade, Batumi remains a uniquely Georgian experience. So if you need a break from all those stunning mountains, do what the locals do and head to Batumi for some summer fun. It’s definitely one of the most unique places in the country of Georgia. There are so many things to do in Georgia the country, that it’s really not possible to list them all here. So for further inspiration for your trip to the country of Georgia, be sure to check out my list of the Best Places to Visit in the Country of Georgia (Europe) and this Georgia Travel Itinerary and Guide. They’re packed with more suggestions and information to help you make the most out of your trip to Georgia. And if you have any comments or want to share your experience traveling in Georgia, just scroll down and tell me about it in the comments! Hi. I am going to Georgia in June and have about 4 full days set out in Svaneti. I am a bit confused about how to spend it… Would like to stay in Mazeri, Adishi and Ushgali, but quite a lot to fit in with proper hikes. Any advice or suggestions? Or perhaps I should just do a trek from Mazeri to Usgali via Adishi, but traveling alone and not sure if alone is advisable. It doesn’t cover Mazeri, though, which I think would probably take an extra day. Or you could speed along the process by hitching rides between the places and just going out for day hikes, which are still quite nice. The whole area is so incredible hikeable that you won’t be at a loss of options! With that said, bear in mind that some trails may still be snowed over in early June, so depending on when you’re going you might need a backup plan. As for traveling solo, I met many solo travelers in Svaneti and I was alone there myself. I didn’t feel unsafe at all. You can also definitely meet other travelers to join up with. Nino’s guesthouse in Mestia is a popular spot for that. Your article has convinced me! We hope to travel to Georgia in the second week of September. We will be accompanied by two kids, aged 5 and 8 who love a great adventure. We don’t drink alcohal so much of that culture will be missed by us, but enjoy good food. 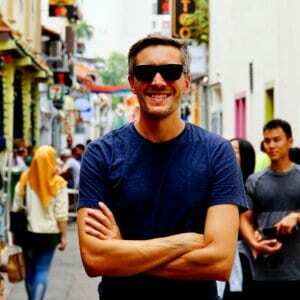 How easy is it to get by in English? How easy is it get around if we rent a car? While Tbilisi has a lot of typical things to with kids (amusement parks etc) we’ve already seen much of the same and more while residing in Dubai. We would like to get out and trek a bit. What would you suggest? We plan to stay for a week. TIA! I’m so excited for you – you and your family is going to love Georgia! And you’re really going to love the food! In terms of English, I got by just fine everywhere I went. In Tbilisi, English is spoken nearly as often as Russian nowadays. In some of the smaller villages, you may still encounter a lot of people with very little English. But generally the younger generations learn some English, so I found that more often than not the children ended up acting as translators. 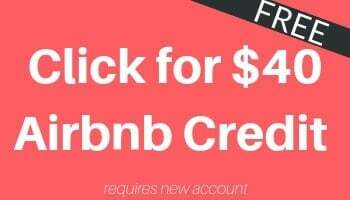 You should be fine renting a car to exploring on your own. Some of the roads in some of the mountain provinces may be a little intense, but they are generally decently maintained and seem ok to drive on (though I never drove myself, I plenty of tourists who did). I think your kids will really love Georgia. 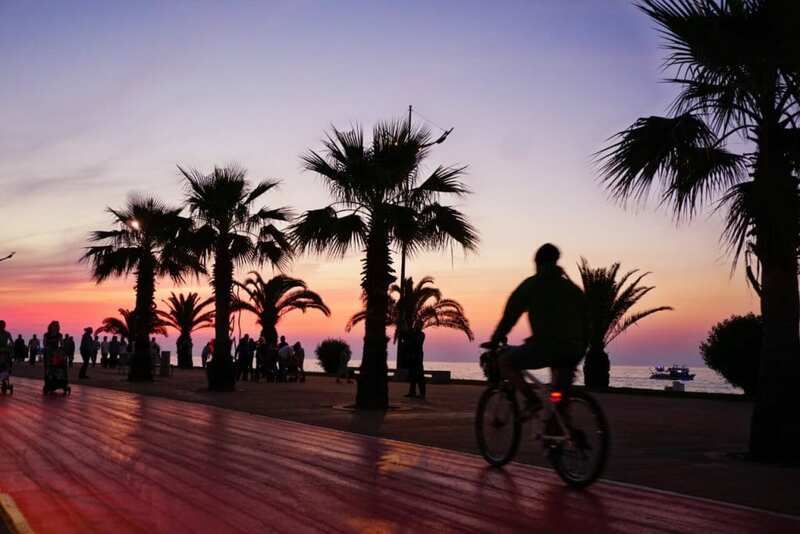 If you make it out to Batumi, there are some family oriented activities there – parks, boat rides, boardwalks, etc. Also, hopefully they enjoy the outdoors, as that is one of the great joys of visiting Georgia. It may be starting to get a bit cold in September in some parts of the mountains, so you’ll need to plan, but if the weather is good, Georgia is a beautiful place to explore outdoors. We plan to walk around Old Town (probably do a local walking tour) our first day. Explore Tblisi a bit more on Day 2 and then I’m stuck for what to do. Does Kazbegi have similar landscape as Sveneti? Because frankly, you’ve sold me on the majesty of Sveneti but I’m worried about the time it takes to get there. There are no flights available, so will have to do the 8 hour bus journey from Tbilsi, or find a car to drive us over. Also, my kids love to hike but doing the 4 day hike will be too much to expect from them. So I’m thinking we skip Sveneti and focus on Kazbegi (if it’s similar landscape…if not, I think we might persevere to Sveneti). Then I read about David Garega and that looks mysteriously beautiful. Then there’s Dashbashi Canyon which looks amazing in pictures. I know you suggested Bautimi for the kids but it sounds very similar to what we have in Dubai so will skip it. We are more interested in green forests, green mountains as these are landscapes we crave while living in Dubai. Also, I’m in the process of finding a driver who can take us around (any recommendations?) who can also give us a lesson on history (so we can skip the museums). Oh and Racha looks amazing! Have you been? They have a forest reserve that looks very pretty in pictures. Yes, Kazbegi is a reasonable alternative to Svaneti for someone on a tight schedule. Additionally, as summer is waning, the weather might start getting a bit too cold in Svaneti anyway. So it definitely makes sense in your circumstances to just focus on Kazbegi I think. Drivers should come relatively affordably in Georgia, or if you prefer a group tour, there are plenty on offer to David Gareja monastery complex (although it is a bit of a drive). I’ve not been to Racha myself, but it is on my list for a return visit. I’m not sure how easy it is to access, given that it’s on the other side of Russian-occupied South Ossetia, so if you go I’d love to hear all about it! I’m excited for you and your trip – it sounds incredible! My goal is now to get invited to a supra! !